In the world that is filled with surprises and natural wonders, flower gardens in India would make you lose yourself within their expanses. There could be a long list of gardens set across numerous cities to travel and soak in the eternal beauty of finely grown flowers. When the scant green gardens bloom with multi-hued, fragrant flowers are laid before you, there is nothing more peaceful attention-grabbing. These flowers constitute about 6 to 7 percent of the flowering plant species of the entire world. Here’s a list of famous gardens in India that can be considered worth exploring and incredible. Take a glance at them. This place prevails right on the top, whenever a narration about elegant and lush Indian flower gardens is considered. This is probably a large expanse with various other smaller gardens being housed within. These include the Shalimar Bagh, Chashma Shahi, and Nishat Bagh. Mughal Gardens acts much like a brand name for all of these. Adorable architecture form Mughal era, neatly manicured lawns, and fountains bringing out the grandeur of the lives in the rich kingdoms that have once breathed there. These gardens had been important and good enough to have their names in history books. 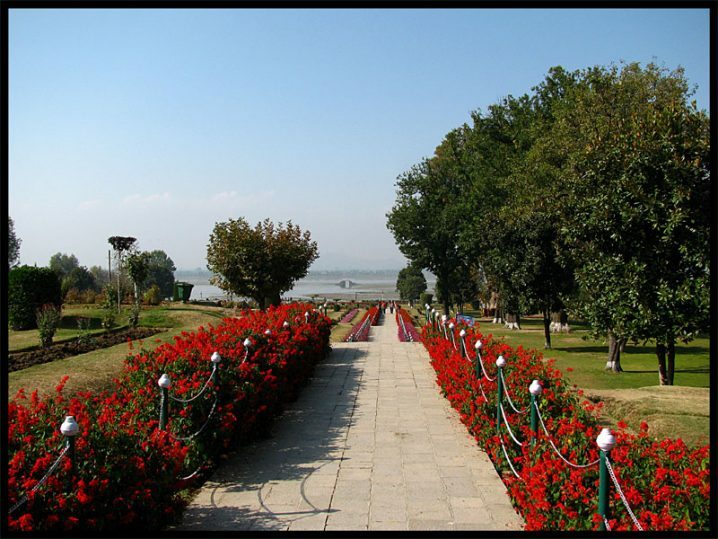 Situated on the eastern side of the Dal Lake, 11 kilometers from Srinagar, the various gardens are known to belong to different periods of the Mughal reign as, as the name suggests. 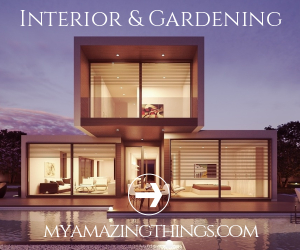 Flowers like Carnation, Dahlia, Marigold, Nemesia, Aster, Chrysanthemum, Daisy and Pansy are some of the alluring blossoms that would mesmerize you greatly. Instigating a perfect shot in numerous Bollywood movies; the Mughal gardens hold on to immense serenity and poetic beauty. These gardens are open for public visits from 9 am to 5 pm except on Fridays. This is one of the famous botanical gardens in India more than just a flower garden. A part of the South Asian region, this garden spreads lavishly cross 40 acres of land and is known to be one of the most diverse among all. This garden was known to be constructed as per the orders of Hyder Ali, Tipu Sultan’s ancestor. There had been about 1854 plant species found here under, John Cameron the then garden superintendent. There’s a beautiful clock made up of flowers and set decoratively with Snow White and the seven dwarfs. There is also a horse –riding statue of Chamarajendra Wadiyer of Mysore that would certainly leave you dumbstruck. 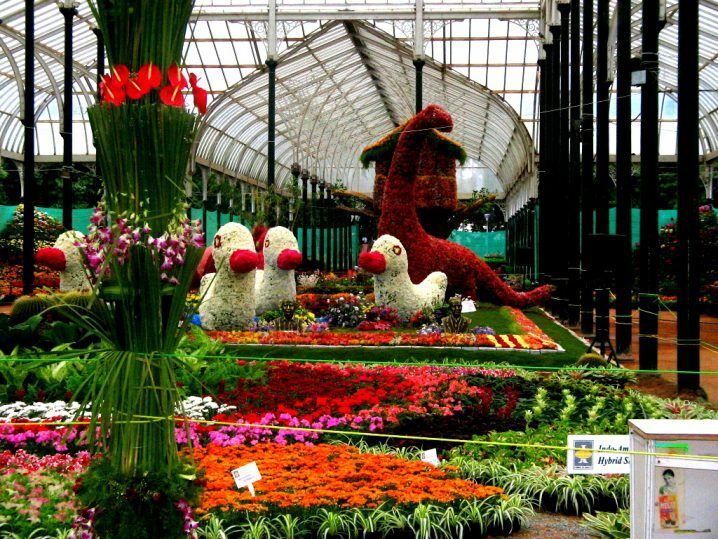 The flower show held in January and August prevails to be the most popular events here. It is an attraction for many botanists and nature or flower lovers from various places. There are numerous flower made architectures in the garden which give the garden a mark of creative thinking and dedication. A view at the glamorous flowers here is a once in a lifetime experience. At least in India tulips are known to be rare. This magnanimous tulip garden in Siraj Bagh, Jammu & Kashmir will leave you speechless with its flawlessness. This is the largest tulip garden in the entire Asian continent. There are at least 70 types of rose flowers surrounding the twelve-hectare land elegantly. However, as tulips remain to be the special element at the place, the name of the garden adheres to them. The location of the garden is another appreciable factor being set on the foothills of the Zabarwan Range, showcasing the breathtaking views of the Dal Lake. Visiting this place would, therefore, be a lovely time of course. 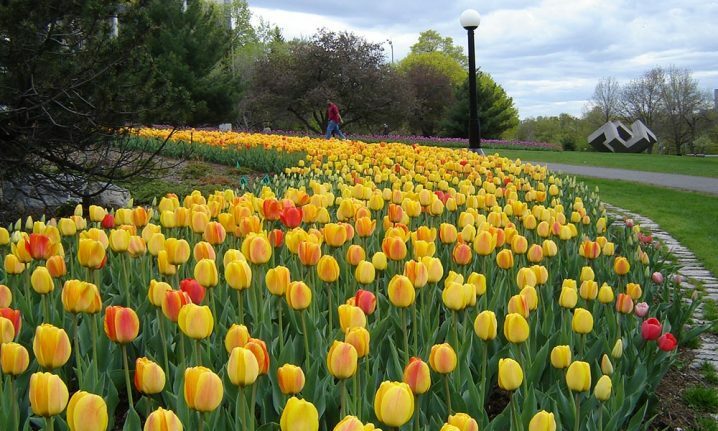 The annual Tulip Festival held every year is a major attraction here. With over 2 million of the entire world’s population visiting here regularly, the Brindavan Garden is one of the famous flower gardens in India. This garden is situated about 20 kilometers away from Mysore, near the Krishnaraja Sagar Dam. This garden is spread over 60 acres of land as one of the most unique tourist attractions in Karnataka and entire India. It had been molded in Mughal styles inspired by the Shalimar Garden in Kashmir. There are fountains, ample terraces, and parterres, lush green lawns, cascading and running water channels, flower beds, shrubs, and trees. When illuminated with lights this garden seems to be a place no less than a paradise. 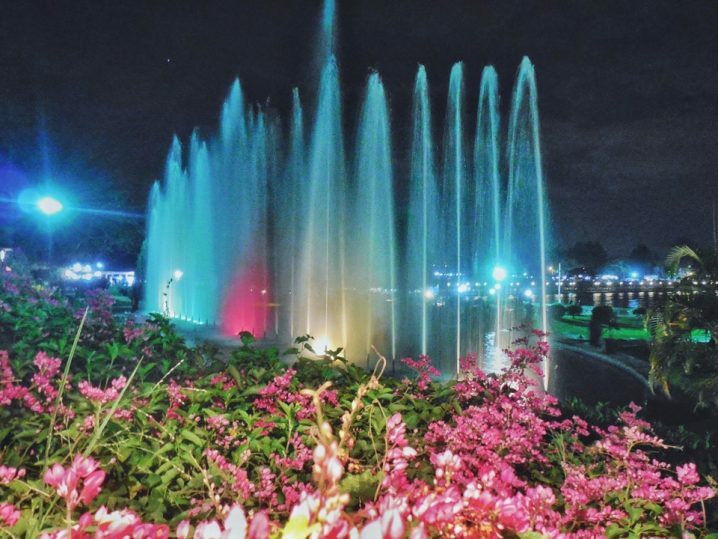 The dancing and musical fountains prevail as the prime attraction for visitors. Brindavan Garden remains to be known for its grandeur and majestic charm. Also known as the Sajjan Niwas Garden, Gulab Bagh is one of the most beautiful gardens in Udaipur, Rajasthan. It was built during the 1850s as per the orders of Maharaja Sajjan Singh. This is a truly elegant garden spread across the 100 acres of land. 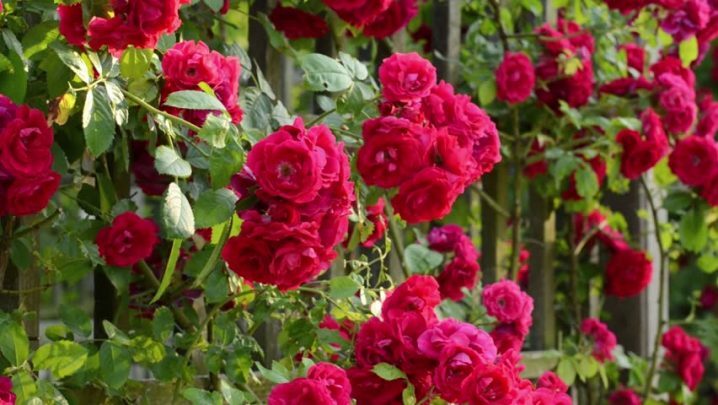 Renowned for the copious varieties of roses allured here it is known to be the largest garden in Rajasthan. It is obvious that the garden got its name due to the abundance of roses here. To the southeast of the City Palace, this garden is situated on the Lake Palace Road on the banks of the Lake Pichola. The garden allures, exotic varieties of roses that are rarely found in India. Driving in tourists from all over the globe this is one of the most famous gardens in history. It is an ideal place for nature lovers seeking in to spend some peaceful moments amidst beautiful surroundings. Attached to the garden is the Saraswati Bhawan public Library. There is also ample amusement for kids in the garden including a zoo with animals and birds and the interesting train ride. Located on the banks of the river Chambal, in southeastern Rajasthan, Chambal garden is one of the most appreciable sights for nature lovers. The garden derives its name from the river Chambal. There are thousands of different species of plants that can be explored all throughout the day along with the charm of the Chambal River. These are some of the most beautiful flower gardens in India that are worth exploring. Though there are many more, these are probably the best.